I think I found a new favorite brewery! That is quite a claim & quite an opening statement but I just want to get it out there. 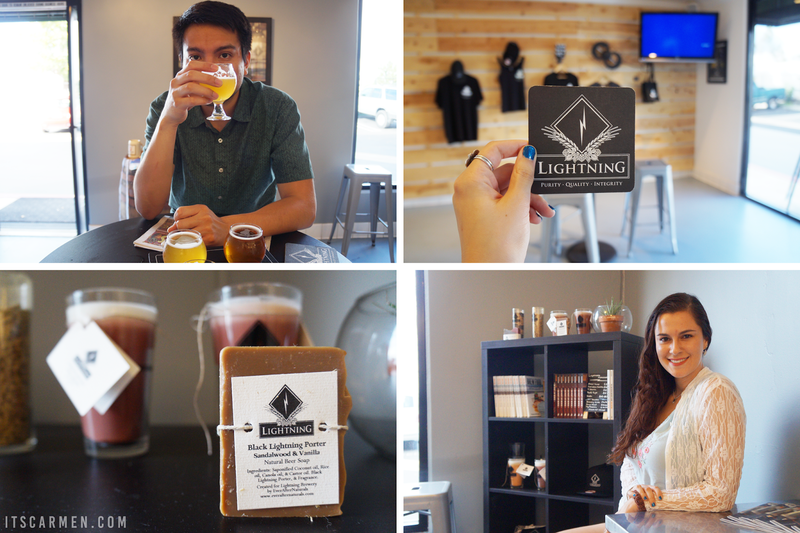 I absolutely loved Lightning Brewery* from the get-go, like the second we drove into the parking lot. It only got better from there. 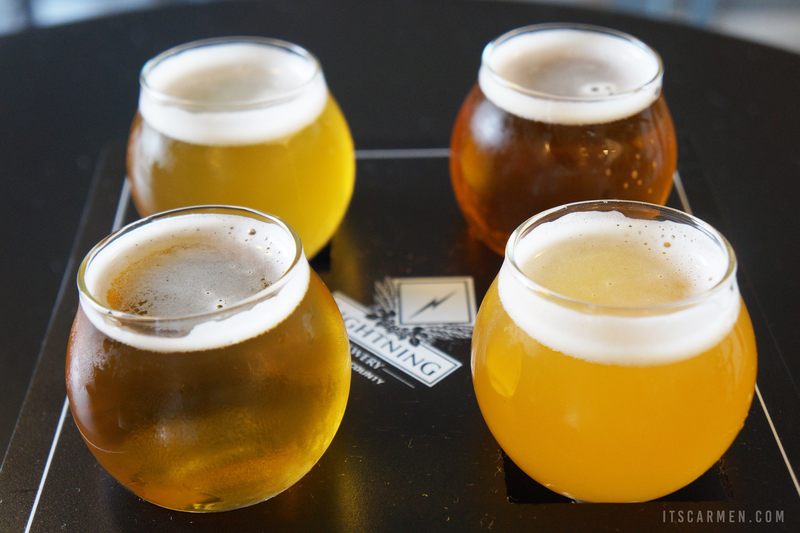 Lightning Brewery is an award-winning brewery located in Poway, California. 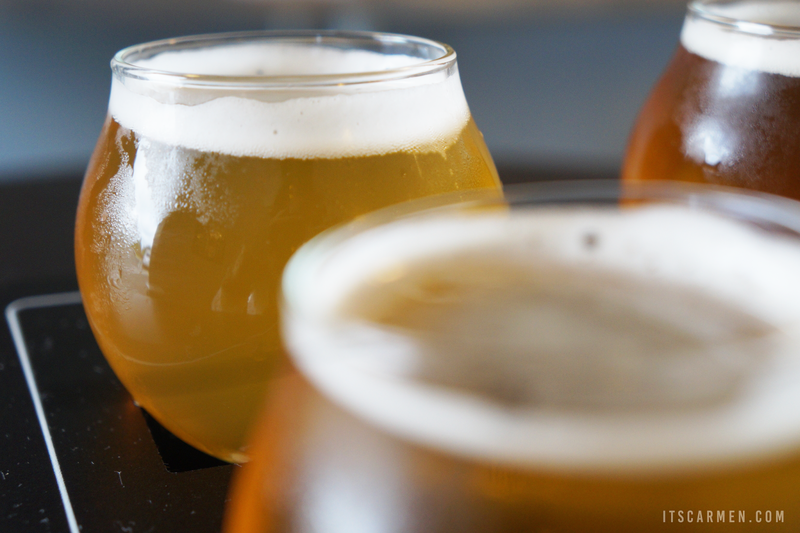 You don't have to travel all the way down to the heart of San Diego to get some good craft beer. 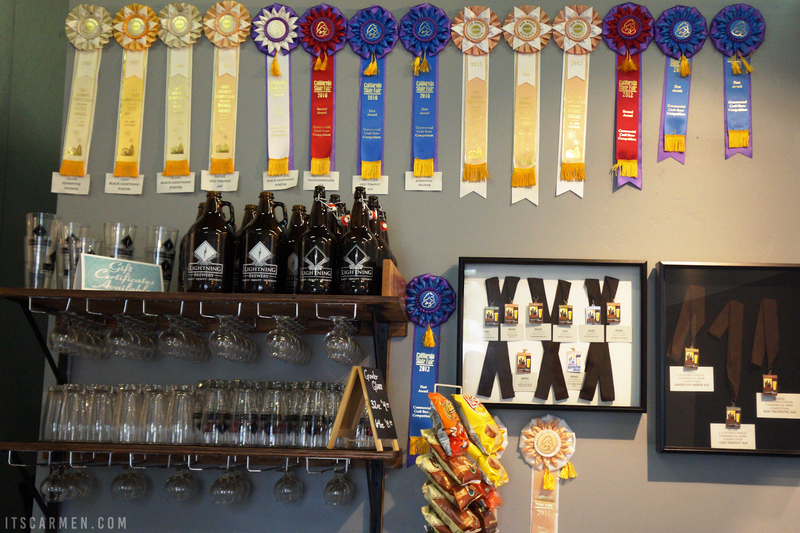 They've been around since 2006 & continue to thrive by selling beers on tap in local restaurants, bottle shops, & grocery stores in addition to the brewery itself. The president & head brewer of Lightning, Jim Crute, also has a Ph.D in biochemistry. The standout factor for this brewery is the pairing of beer & science such as understanding the chemical process of the grain's enzymes or the biochemical processes between the simple sugars & yeast growth. To me it sounds like mumbo-jumbo because I have no idea about the science behind beer, but I like the idea of utilizing science to better the taste & experience. When I go to a brewery, bar, restaurant or what have you I want to enjoy the experience. I like the establishment to be relatively quiet because I want to chat with friends without screaming at the top of my lungs. 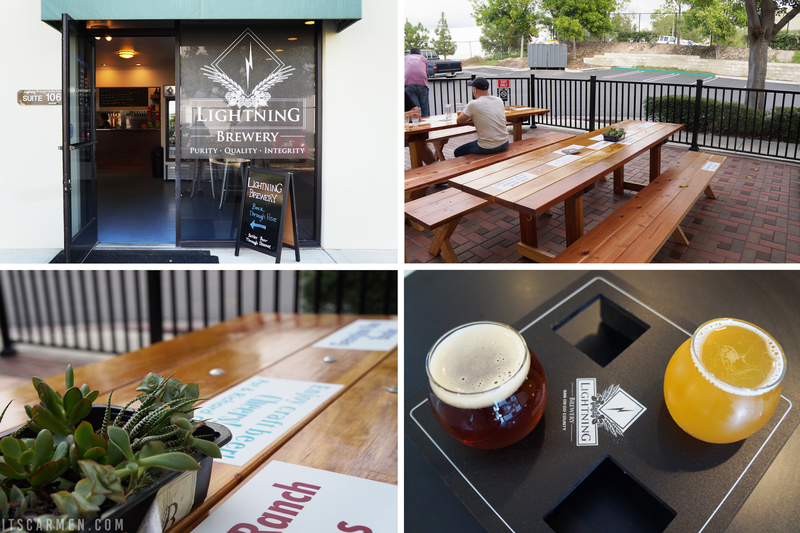 Lightning Brewery has both inside & outside seating. Inside, there are a few small round top tables with metal stools to perch yourself at. Outside are a couple long wooden tables with benches. There were a handful of people, enough to know they enjoy going there but not so many that you can't enjoy it yourself. The background music is perfect for talking with friends -- not too loud. "Ambient rock," my boyfriend, Fred, said, "I like this place a lot." Kathryn was the beertender at the time & she was just a joy to be around. She was attentive, kind, & knowledgeable. My boyfriend was with me & she offered him a drink of his own at least a couple times, which no other brewery has ever done. For the sake of safety & not getting too drunk I like to bring him along & we simply share the tasters. Although we declined Kathryn's offer, it was duly noted & appreciated. When it comes to doing brew reviews I like to do a taster of everything on tap; it helps me to get the full scope of the brewery without committing to an entire pint. 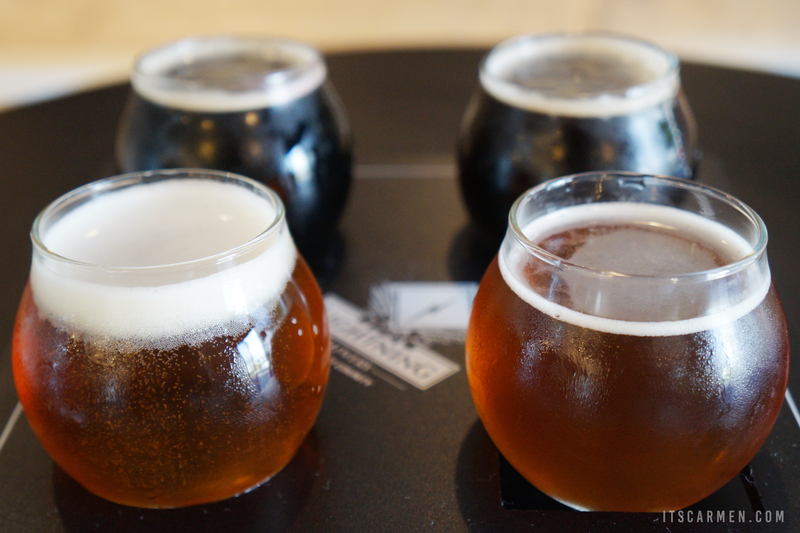 Statistically speaking, Lightning Brewery had many exquisite, uncommon, & appetizing beers. I tried 10 tasters & I must say that at least seven of them were one-of-a-kind in comparison to other beers I've tasted. I'll highlight my absolute favorites as well as the most unique. Thunderweizen Ale - This is a heavenly spin on the classic Hefeweizen wheat beer. Lightning Brewery leaves it unfiltered to keep its flavor. The ale is 5.8% alcohol by volume (ABV) making it approachable enough to drink it without having a hangover the next day. Electrostatic Ale - Beware of this scrumptious beauty; it has 11.5% ABV! It's thoroughly enticing so do be careful & proceed with caution. It's not as innocent as it looks. This French style biere de garde won over my boyfriend. He closed his eyes, moaned, & said "Oh yeah." Dark Current Ale - Delicious! This has a pleasant complexity with currants & orange zest. It's magic for your senses because you can smell the currant & taste the orange zest. The ale has a beautiful myriad of flavors & is one of my top choices! Fig Honey Barrel Aged Wheat Ale - The beautiful light honey color automatically attracted me. It has 8% ABV & is fermented in a wine barrel. You can really taste the mixture of figs with honey. Each flight would normally cost $5 for four tasters except for the Chardonnay Barrel Aged Electrostatic & the Fig Honey Barrel Aged Wheat Ale, which are $2 apiece & can't be included in a flight. That means I received approximately $14 worth of beer as well as a pint glass for free. I would hands-down, no questions asked return to Lightning Brewery & spend my own money here. 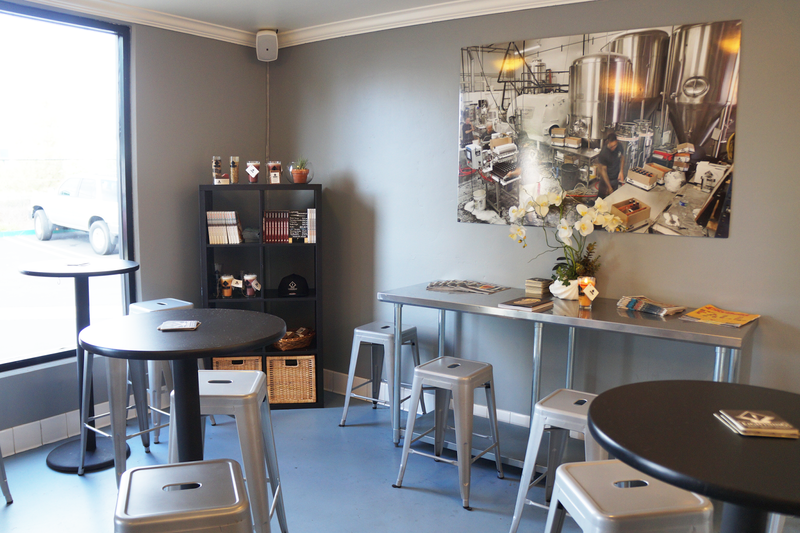 It has an open, relaxed, welcoming environment paired with undoubtably tempting beers. The flavors are unique enough to hold their own & can't be compared to any other beer or brewery. The noise level was agreeable; the service was friendly; the experience was magnificent. 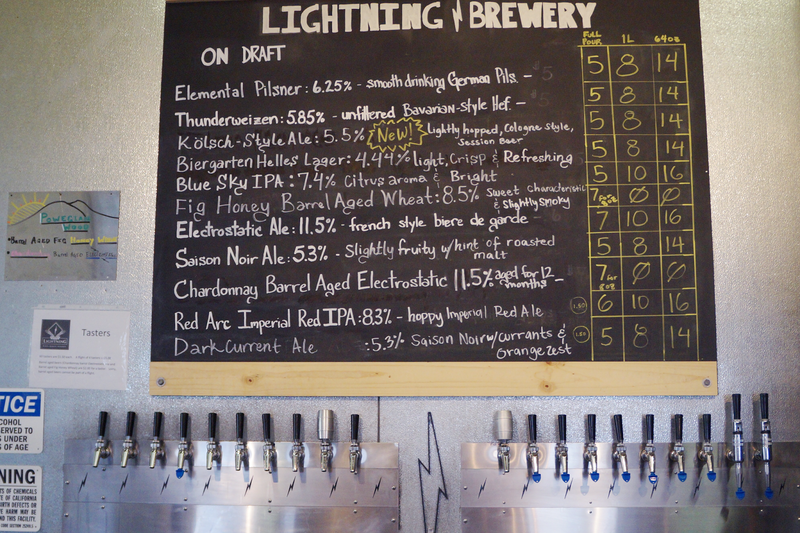 I would highly recommend visiting Lightning Brewery if you happen to be in Poway or the San Diego area. Subscribe to my newsletter for social media tips to your inbox every week. Cool place ! So warm and comfortable ! Lightning Brewery looks awesome! I'm a huge fan of trying out new pubs and breweries! Oh yum!! I'll take all of these. Great shots! I love those glasses!! That place looks awesome! Cool spot! Looks like you had a great time! Nice! If i lived closer I would definitely give it a try. The orange zest and the honey one sound really good. Seems like a really nice place to hang out with friends! Thanks for dropping by babe! wow, what a cafe-like ambiance! it's one of those places i would totally go for a drink or two to catch up with an old friend :) lovely review! I'm glad you had such a great time at this brewery! 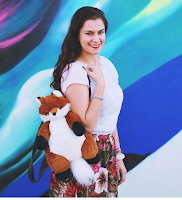 Sounds great, Carmen! I'm actually not a beer drinker but the process of making is definitely something I would love to see in real life. Seems like a very cool spot, loved the photos! I think there's always something so enticing about incorporating science into the food industry; I'm LOVING the sound of Lightning and I'd love to try the place out one day! Hi Carmen...Breweries are always a great find and those glasses are adorable..
Lovely place! Love the shape of the glasses! Looks very nice! Wow I will have to go visit next time I am in Poway! My husband is a beer freak and San Diego is his favorite city, this has birthday trip written all over it! Thanks for the tip!